This film represents a perfect example of mainstream film that leverages pigeons for multiple purposes (creating perturbing or pitiful feelings in the spectator) . 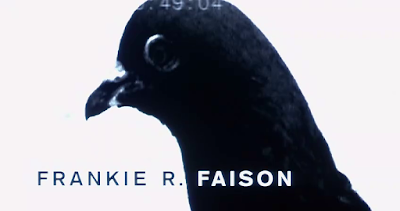 The first pigeon appearance is in the main credits. Here, pigeons are shown in grey scale, recorded with low resolution by surveillance cameras. Here pigeons are shown as mysterious and slightly hideous creatures. In this scene we can see a close up of a pigeon and several shots of pigeons in parks (the reason the security cameras are recording pigeons is uncertain, maybe they were calibrated by a pigeon fancier). 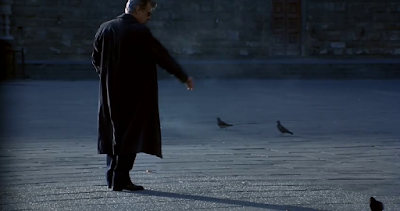 What is more clear is the reason for introducing pigeons in this point of the film: they were used to represent Hannibal Lecter. In the scene, a large flock of pigeons gathers and creats Hannibal's face. This image lasts for a very short time. It is both disturbing and quite an achievement to find a mixture of pigeons, pixel-art and cannibalism-exaltation in a single shot. According to Wikipedia: The tile sequence remained on Scott's mind and would eventually end up as the main title sequence. 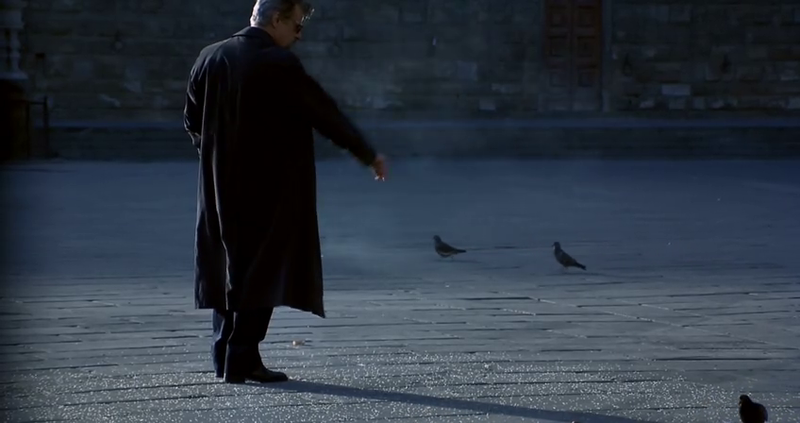 Livesey would gather footage of pigeons in an empty square in Florence early one morning which, in the final cut, would morph into the face of Hannibal Lecter. Scott believed it a good idea, as it fundamentally asked the question: 'Where is Hannibal Lecter?' Scott explains: "And of course this story tells it, with pigeons in the cobblestones of somewhere, where you wonder where that is ... and there he is... his face appears.". The titles are said to have been influenced by the film Seven. Later, in the film, Hannibal tells a perturbing story about roller pigeons (pigeons with the ability to roll in the air) to justify how behavior can be controlled by genes. He mentions that there are two classes of roller pigeons, deep rollers and shallow rollers. When two deep rollers are bred together, their offspring will roll to the ground and kill themselves. The scene that includes this conversation can be seen here. A curious story that is unclear whether true or false. 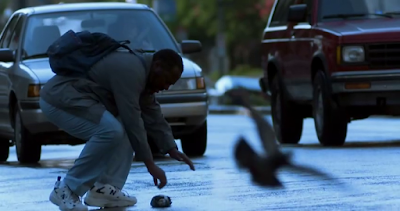 There is a counterpart to this scene related to one of the characters that rescues an injured pigeon from a road and tries to take care of it. This action clearly shows that he is a noble person. Although this is a secondary character, he provides a crucial hint to the research of the investigation into the case. Source: Hannibal. Starring moments: 0:3:40, 0:4:24, 0:24:30, 0:27:33, 0:29:03 (last three timestamps represent a pigeon hotspot). 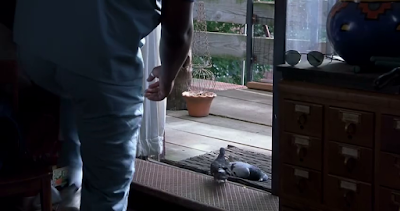 Pigeon activity: This film contains several pigeon appearances. All of them are wild pigeons that roam, fly or lay in public areas. Symbolism: The first pigeon appearance (in the main credits) is full of symbolism. Both the intriguing representation of the pigeons as well the formation of Hannibal's face, create the impression that the dark shadow of Hannibal Lecter is so shape-shifting and ethereal that it can appear and disappear anywhere. Relevance: Medium. Unfortunately the pigeon activity does not have a relevant impact on the film plot. 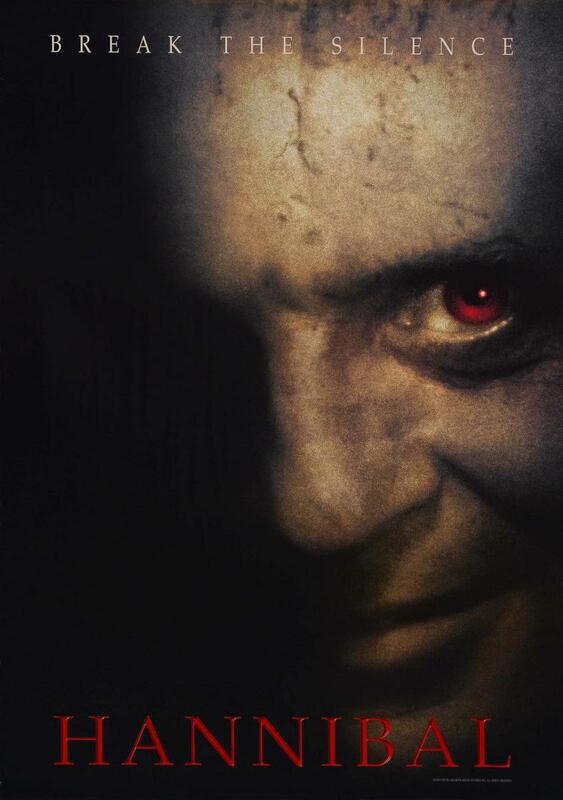 However, they are the protagonists in the main credits and are mentioned by Hannibal Lecter. Training level: Low. 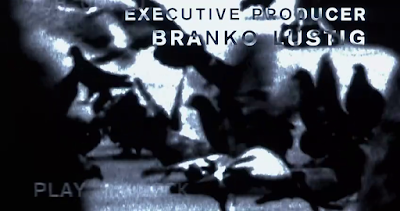 The pigeon appearances in the main credits are wild animals or CGI generated. The other one, that lays injured, does not perform any action and probably is a sedated animal or a dummy. 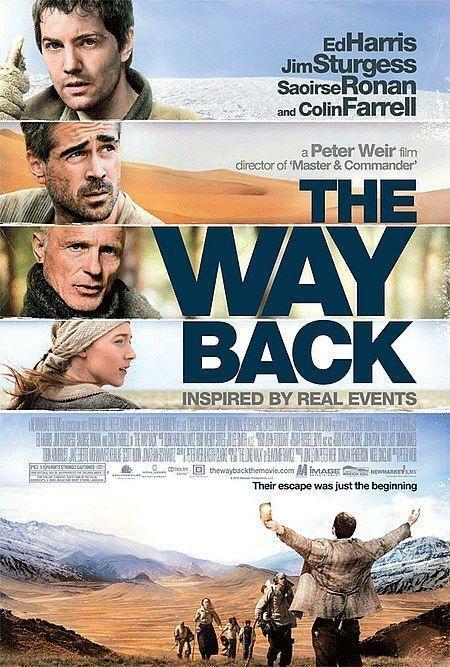 Several prisoners in a Russian gulag manage to escape a make a trip of thousands of kilometers to their way to freedom. I enjoyed watching this adventure film with great shots and some intrepid doves. When the group of survivors reach an abandoned buddhist temple they decide to investigate the ruins. And this is when two doves and a pigeon suddenly appear from the ruins and fly away, startles, from the new visitors. The dove silhouettes can be noticed at the bottom of the image. Pigeon activity: A small group of birds flying away when the protagonists arrive at the scene. Symbolism: Although there are some references to doves in buddhism, the use of doves and pigeons in this films seems to be more coincidental relating to wild animals that occupied an abandoned building. Relevance: None. The birds do not interact with the protagonists of the films thus they do not influence the film plot. Training level: Medium. It seems that they are trained animals released in the film scene. They perform well flying almost vertically in a narrow building. 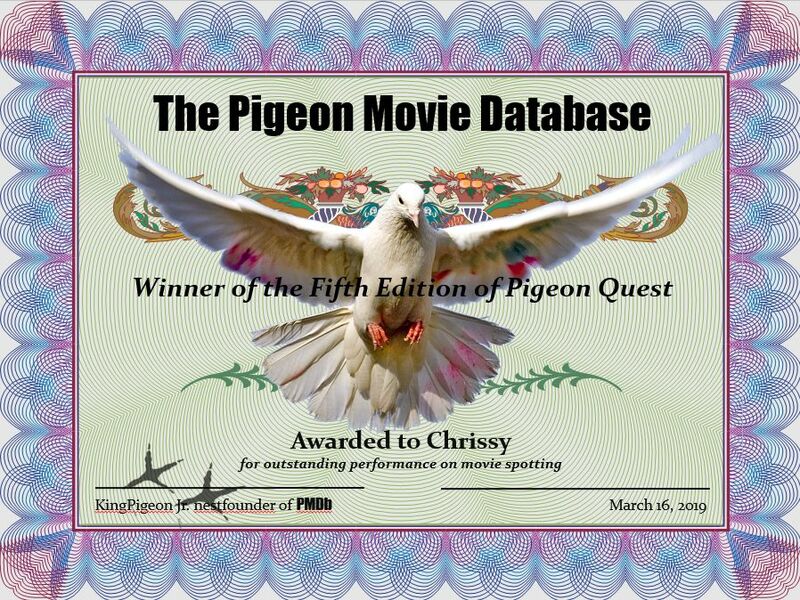 At PMDb we congratulate Chrissy as the winner of the fifth edition of Pigeon Quest. Congratulations on your fine pigeon-spotting performance. You can download a high-resolution image of your certificate here. Here is an link to at-a-glance visual list of the covers of films and TV series that have been posted so far. The list is ordered chronologically. Each image contains a link to the related post. I have a much longer list (with tens of films) that have been reported but not reviewed yet - thank you very much to all the pigeon spotters and film contributors who have shared information with me. My plan is to gradually enrich the PMDb with these feathered findings. 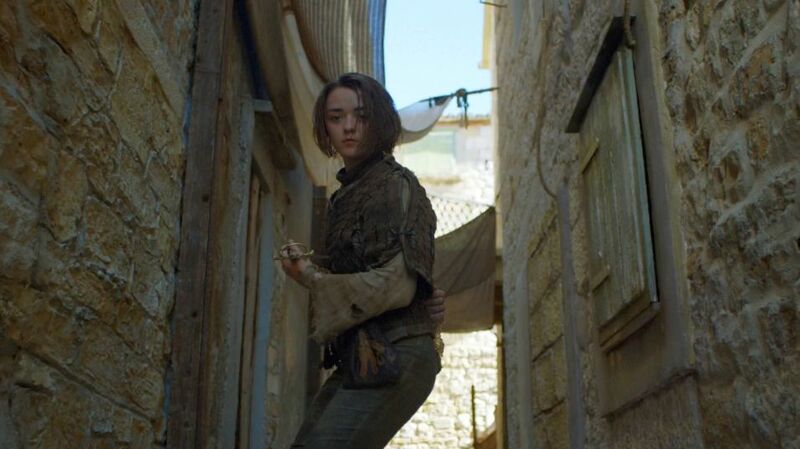 It is almost impossible to do not feel pity for Arya. She lost half of her family, she was forced to run away, living a life of poverty and, on top of that, she is surviving in an extremely violent environment. Any social worker from the Office of Child and Family Services would place her in a special protection program. However, she also has a dark side, a cruel mind that not only thinks about revenge, but about pigeon carnage. Her violent actions were performed not in one, but several scenes during this tv series. In this entry we can see one of them, where this young girl is having fun beheading an innocent pigeon. The scene is shown below. No additional comments are necessary. The poor pigeon is not aware of the great jeopardy that is coming. Arya slaying an innocent pigeon. The most tragic part of this story is Arya's face after this unfortunate training practice: she shows nothing, not shame, not happiness, just a cold, inexpressive stare towards the dead bird. A pure gem for psychotherapists. 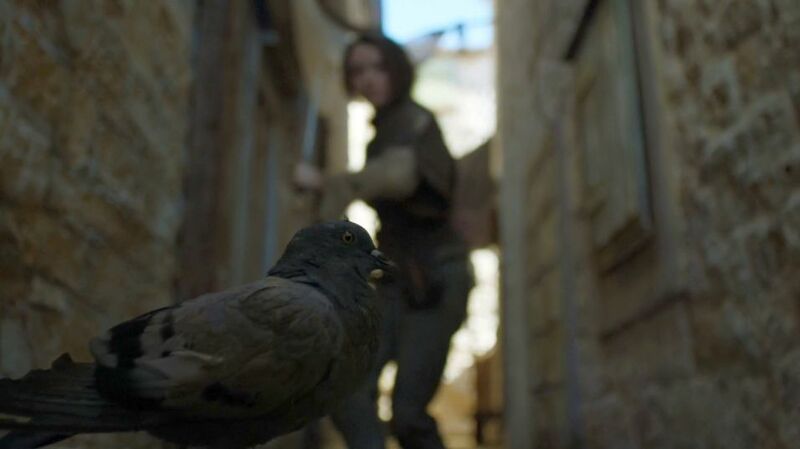 Arya, pigeons will never forget this offense. Pigeon activity: It is a common pigeon belonging to the Game of Thrones' universe that has a fatal encounter with a bored killing machine eager to slash living forms with her sword. Symbolism: Performing this action against a pigeon (one of the most harmless creatures on Earth - ignoring the dropping-related side effects or the intense cooing during the mating season-) is a clear example of how deranged the poor girl is. Definitely, not a good choice for babysitting. Relevance: For the poor pigeon character, high, because it is the end of the story for the animal. Looking at the bird's head size, it seems like a female pigeon. I hope that it is not the breeding season and there are no squabs waiting for her. Training level: Low. The pigeon shows steely calm facing its final like the musicians of the Titanic. The difference is that here the iceberg has a sword. Samba: unconfirmed pigeons in Paris. 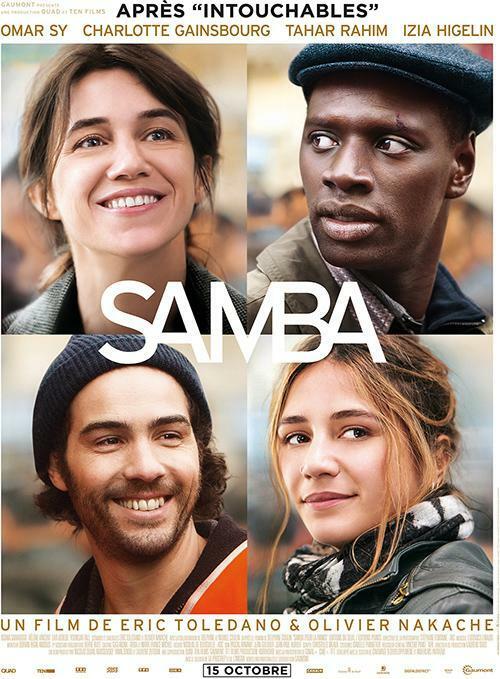 This film depicts the tough life of an illegal immigrant (Samba) in Paris, how he is forced to accept all kinds of jobs to survive in the city and how he falls in love with Alice (Charlotte Gainsbourg). Although we empathize with Samba, the reality is that we are only focused on pigeon appearances in the film, so we will skip describing his adventures. 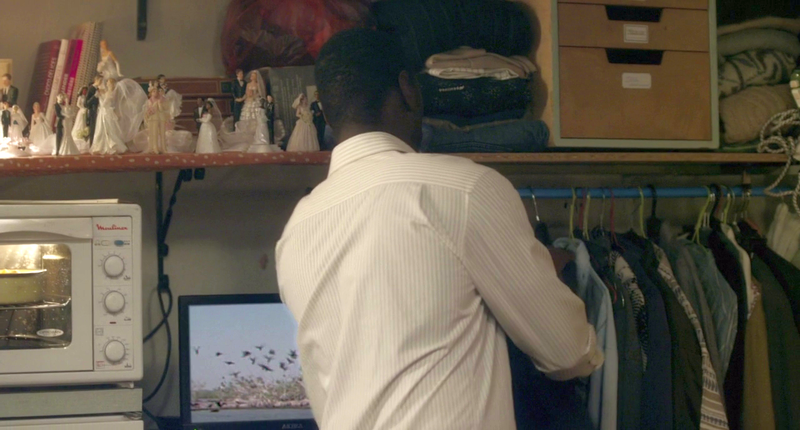 There are two scenes related to pigeons. The first one occurs when the police scramble onto some scaffolding to catch the immigrants, Samba and his friends escape running on the roofs of buildings. When Samba is leaving a roof hatch we can hear pigeons cooing and see a feather next to the window (red arrow in the screen shot). Of course, this does not count, it is a near miss. 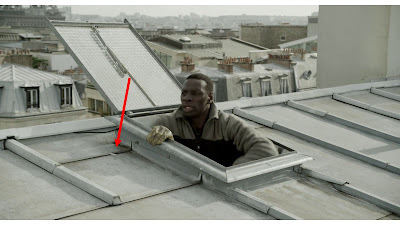 A small feather (pointed at by the red arrow) next to Samba, the film's protagonist. 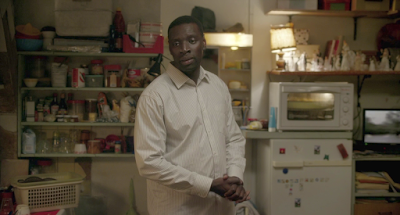 The second scene is more explicit: Samba is talking with his uncle, who is in depressed because he has lost his job. In this picture we can see Samba's uncle's sadness. Samba is trying to encourage him to start a new project and is getting dressed for a date with his girlfriend. In the background we can observe a tv playing a documentary and some birds (unconfirmed pigeons) flying way. We would have to find out the documentary's name to clearly discern where they are pigeons or other birds. Samba is getting dressed. We can observe the tv on the right side of the screenshot. Here we can see the tv with more detail. Some unconfirmed pigeons appear. Pigeon activity: A flock of unconfirmed pigeons fly away, probably scared by the camera. Symbolism: None, they represent wild animals. Relevance: Low, they are part of a tv documentary that Samba's sad uncle is watching. 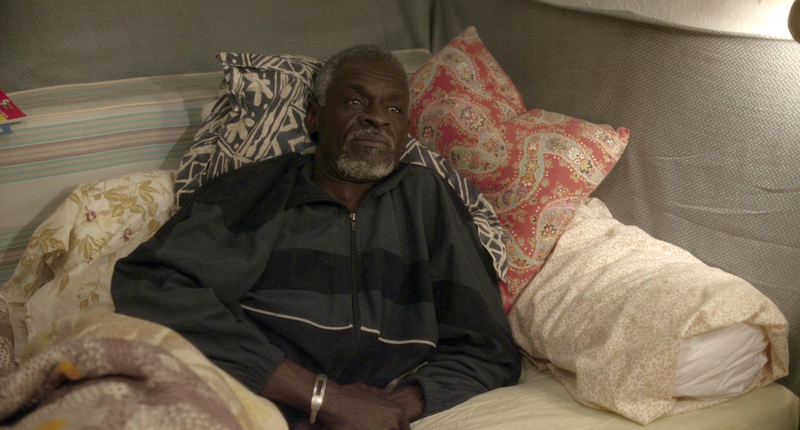 It is not clear whether this documentary helps him to feel better. Training level: None. They are wild animals.